Key Knife identified the need for a new planer head that would help planer mills increase production, lower production costs, improve finish, and enhance employee safety. Key Knife used their extensive knowledge of indexible knife technology to create the revolutionary Key Planer Head. The innovative design of the planer head and the use of a smaller disposable knife allows for more knives in a cutting diameter. The result is a planer head that will significantly improve your surface finish, production volume, operating efficiencies, and safety. •The Key Planer Head can house up to 100% more knives in a given cut diameter vs. conventional heads. This unique capability gives mills the option to increase line speed without sacrificing finish. •Ridge Strip Knife lasts 2-3 times longer than conventional knives, reducing frequency of knife changes, ultimately increasing uptime. •If contaminants nick/damage knives only the damaged Ridge Strip Knives need to be replaced (and jointed in)...significantly reducing downtime. •The Key Planer Head's innovative design allows for up to 100% more knives in a given cut diameter vs. conventional heads. The increased knife count yields an increase in cuts per inch. The Key Planer Head gives planer mills the option to improve finish and/or production. •2 sided Ridge Strip Knife lasts 2-3 times longer than conventional knives. 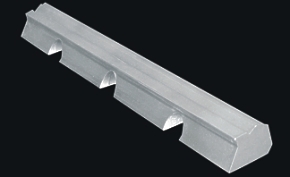 •Small Ridge Strip Knife is safer to handle and easy to install. The Ridge Strip knife has two edges that have proven to last a minimum of 2-3 times longer than conventional flat knives. After both edges are used simply throw the knife away. Costly and time intensive knife maintenance, such as grinding and weighing/matching knife sets, is not longer needed. 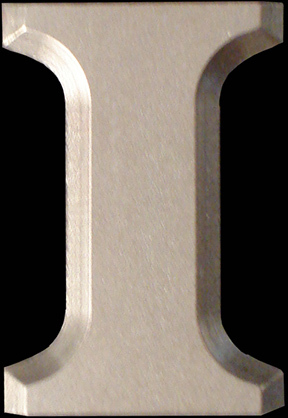 Precision machined from high grade alloy steel and balanced to ISO G1.0 spec to minimize vibration. The Key Planer Head is available for both integral and hydro-lock arbor clamping systems. 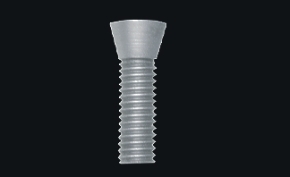 The gib screw is ideally positioned perpendicular to the center of the shaft to insure proper knife placement, and eliminate the need to torque the gib screws in a pattern. The gib screw is induction hardened to prolong part life and eliminate problematic stripping of the bolt head. 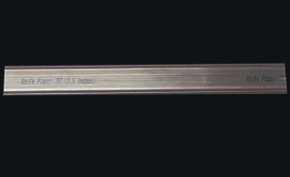 Manufactured out of chipper steel for strength, durability, and wear resistance. 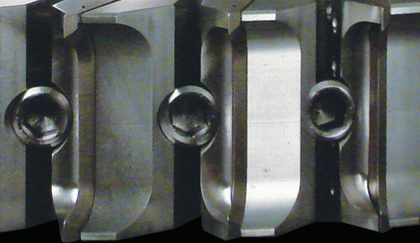 The gibs tight dimensional weight tolerance eliminates the need to weight/match gib sets. Available for both dry and green target sizes. Allows for quick and easy knife change and setup.